This incision is part of a series of thirty graphics titled Pasadena, like the Californian city, the seat of the Botanical Garden that inspired these works. In fact, Frangi photographed the Botanical Garden, reinterpreting images. The works have been exhibited in a solo show in Udine in 2008 and published in the catalog of this. Giovanni Frangi was born in 1959, in Milan where he still lives and works. From 1978 to 1982 he studies at the fine arts Academy of Brera, and the very year after, he debuts with a group exhibition with some painters and sculptors. This first experience is immediately followed by another exhibition in Turin. In 1986 he attends a personal exposition at Bergamini gallery in Milan, and in this occasion his catalogue has the comment of the famous art critic, Achille Bonito Oliva. In 1989 for the first time he decides to expose abroad, and more precisely in the Galerie du Benneret (berna), and after in Barcelona (1989) New Orleans (1993), Carmel (1994), Lausanne (1995), Hong Kong (1997), Marseilles (1998), San Francisco (2000), Los Angeles (2001), Pechino (2005), Hanoi (2007) e Frankfurt (2008). Meanwhile he continues his activity in Italy. In the ‘90s takes part to the exhibition “italian Landscapes”, in which is possible to notice how he developes his artistic research and the leading subject of landscapes. 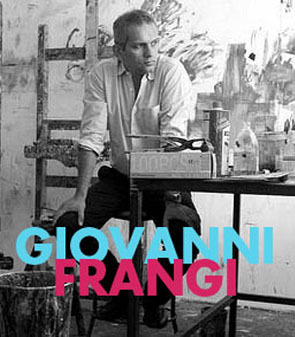 In 1996 he exposes at the XII Quadriennale of Rome, where he wins the first prize, and gains the chance to expose La fuga di Renzo (10 canvas) in the ancient room of Montecitorio Palace in Rome. For the first time Frangi doesn’t think 10 different canvas, but he creates an uniform cycle. In 1999 he exposes in Hong Kons and presents with Giovanni Agosti the exhibition Il richiamo della foresta in Milan. More exhibitions take place in Milan, Venice and San Francisco. 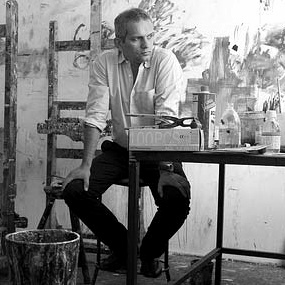 In 2001 he is in Los Angeles, where 12 canvas are shown to the public of the Ruth Bachofner Gallery. In 2004 he exhibit his works in Varese. From 2005 to nowadays he exposes in several italian cities, such as Bolzano, Udine, Bergamo, Rovereto (at the MART museum) and more in international cities.